Feel like you have tons of clothes, but nothing to wear? 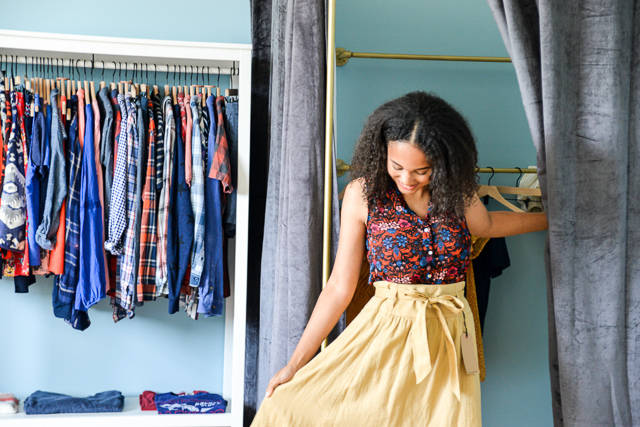 Kimberly Monaghan, founder of The Wardrobe Refinery, is here to share a few expert tips on how to clear your closet and feel confident in everything you own. Be prepared to pull everything out. Otherwise, you may miss some of your favorite pieces that have fallen off of hangers or have been squashed between things you never wear. 2. Start with what you love. I always start every closet clean-out by making a “love” pile. It really helps to start from a positive place, and can also help you determine why you love the things you do. You can use this as a test for everything else, which is now in the “I don’t love it” category. 3. Use the pile method. Start pulling out the items you don’t love, and start categorizing them. The categories totally depend on you and your needs. Here are some common ones that come up in my line of work. “I might love it, but need to try it on to see.”-this pile is temporary. Do not get too attached to it. The hardest pile to get through is “I might love it, but need to try it on to see”. You HAVE to try things on your body to know if you love them or not, and once you do, it has to go into one of the other categories. 5. Ask yourself hard questions. If you have some items you are wishy-washy on, ask yourself some tough questions. What is making me feel this way, and does it come from a positive place (ie, I see it and think about that time with my best friend), or does it come from a negative place (ie, I need to lose weight, I am ashamed of myself, I am supposed to be the kind of person who likes things like this, etc)? If it comes from a negative place, it has to get out of your line of sight, because every time you see it you are giving yourself a little micro aggression, and you don’t need that in your life. 6. Finish what you started. I find that this is where people get stuck, because getting through the first 5 steps is hard work, and the easy thing would be to put it all back in the closet and grab a glass of wine and start watching Queer Eye. DO NOT DO THAT. Ok, grab the wine, but then come back and deal with each of your piles. You are almost done! With your love pile, put them front and center in your closet so that every day you see them right in your line of sight. If you can see them, you will wear them. Functional items, that you use all of the time need to be somewhere you can access them easily, but they don’t need to be the stars of the show. Costumes can be stored either in the back of the closet or somewhere else depending on how often you use it and your space limitations. For nostalgic items that you don’t wear, I recommend thrifting a pretty storage box or even framing and hanging it up in your closet. If it makes you happy when you see it, but you can’t wear it, preserve it so you can get as much joy out of it as possible. Anything you want to sell, make a plan right now. If you don’t, it will just sit there taking up valuable physical and brain space. If you don’t think you will really sell it, then consider adding it to your nope pile. Bag up the nope pile and put it in your car ASAP and go donate it. Get it out of your life to make room for what you love. Ready to Call in the Pros? Book a professional closet clean-out and personal styling session with The Wardrobe Refinery.